A life + style blogger, a Bollywood addict, a home baker, an army brat who loves Indian weddings and a true Punjabi, Devina from Guilty Bytes is all set to get married this November. And the pretty bride-to-be will be sharing all the little details of her bridal journey with us! Here’s the sixth post from her #ShaadiDiaries. 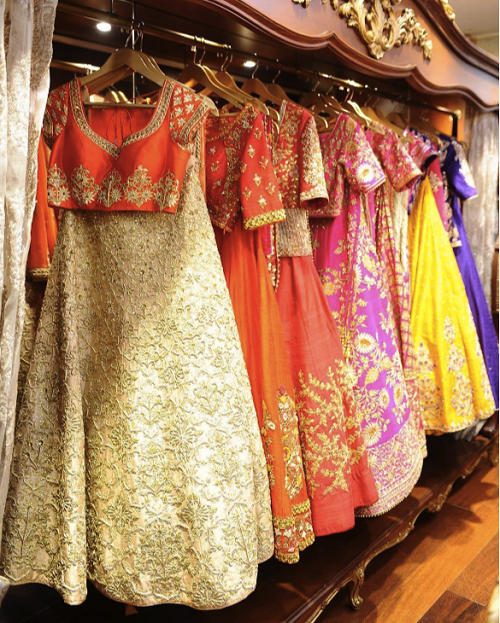 Click here for the previous post on her bridal lehenga fittings! 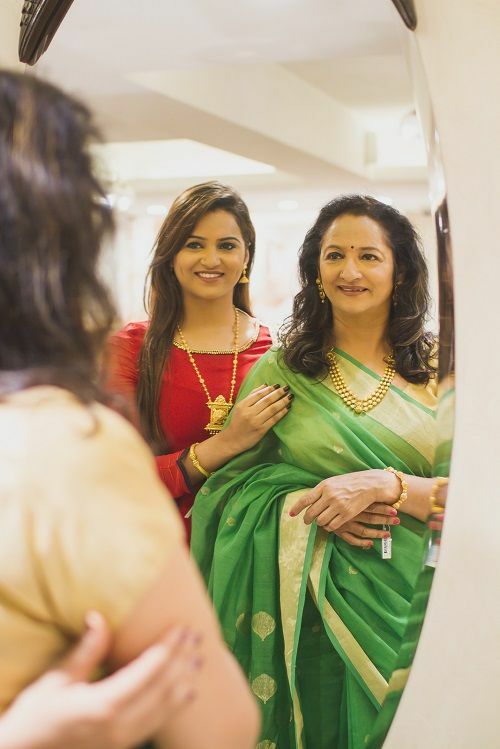 Whether it’s an elegant kanjivaram or a beautiful lehenga choli, my mom and sister are just about as excited as I am when it comes to dressing up! And interestingly, I discovered so many new things about both of them during our long shopping trips… things I hadn’t known for years owing to my busy schedule. 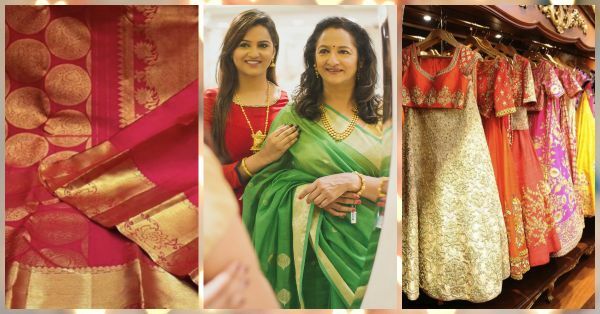 I was REALLY surprised, as we planned outfits for the mother and sister of the bride, that my mom had been meaning to wear her own, 30-year-old wedding lehenga on my big day. And she was already thinking of ways to style it differently and to make the ensemble work! My mom wore a gorgeous gota lehenga on her special day along with a dogri nath and jewellery that I have decided to wear as well. Her lehenga has an umbrella cut with no kalis and is a bright red raw silk skirt with embroidery all over. We decided to tone down the skirt since it’s pretty rich looking with a dual toned silk choli and a double shade dyed dupatta in chiffon. She didn’t want to wear a net dupatta since the original lehenga didn’t have one. The choli has shades of green and aqua and we got the neckline embroidered in gota to blend well with the skirt. The dupatta on the other hand has gota embroidery with red coloured pasting and tassels to complement her ensemble. Also read: #ShaadiDiaries: My Pre-Wedding Skin, Hair & Fitness Regimen! Mom is wearing different styles of outfits for all occasions and for the mehendi she has settled on a pista green anarkali with chikankari work. Green is the theme for my mehendi! 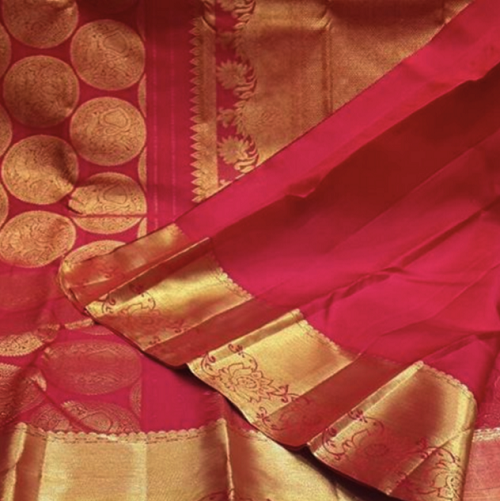 She will be wearing a beautiful kanjivaram saree purchased from Nalli, Chennai for my sagan/engagement. Kanjivaram Saree For the haldi and chooda ceremony, the theme is yellow and mom will be wearing a long, fitted kurta with embroidery and palazzos. Palazzos look great on elderly women as they elevate the regular salwaar-suit look. Plus, they are super comfortable too. Some of the brands I would like to recommend for mothers of brides-to-be are Meena Bazaar, Nalli Silk Sarees, Fabindia, Raw Mango, Sue Mue (Green Park) and Asha Gautam (Defence Colony). For fabrics, KC Creations in Lajpat Nagar is a must visit. Also, while some moms prefer wearing neutral palettes of beiges and browns, I think it’s about time that they started to don colours that compliment their skin tone. Colours always look great and one can always add softer shades in the form of dupattas and accessories to rock the ensemble. My sister, who also happens to be my maid of honor, knew from the start that she would wear a benarasi silk lehenga on my wedding. 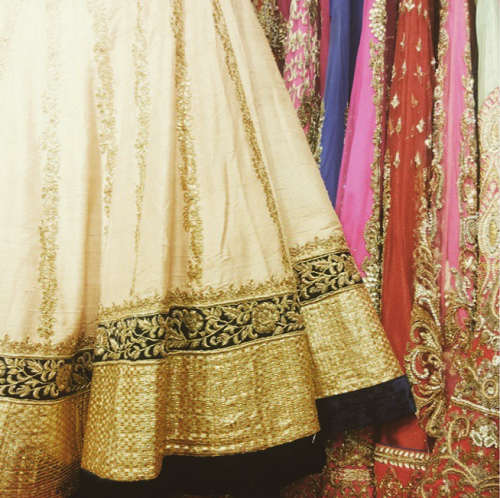 What she was really particular about was a lehenga with no borders and an unusual benarasi print. It took us a while but we found the perfect print at Frontier Raas, South Ex. She is wearing an orange-pink lehenga skirt with marigold flower prints in gold. For the choli, we opted for an overall mirror work blouse in hot pink and a dupatta in benarasi silk fabric. It is a beautiful combination indeed. Frontier Raas collection For the mehendi she is wearing a Rajasthan-inspired poshak and bandhini lehenga in green. With a mustard choli and a pink net dupatta - this is one outfit I am personally really looking forward to seeing her in.